The Princess and the Pig, Princess Pigtoria and the Pea, The Three Ninja Pigs, and The Great Pig Search for Immediate download! 46 Pages. Only $18.95! Sharable within your school! Bert and Ethel's pigs have escaped! Now, would you believe it? The pigs are sending post cards from Florida! What can Bert and Ethel do except to go find them! Join Bert and Ethel for this merry chase! This will be the most fun book you have ever read in a "country dialect." 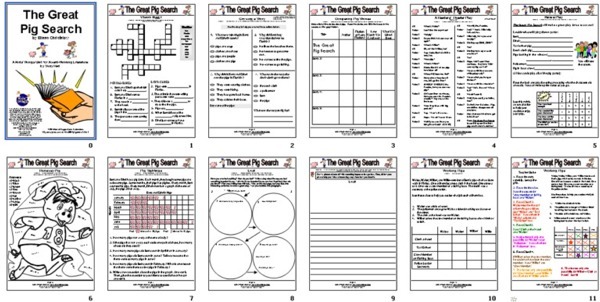 This Unit for The Great Pig Search is part of a collection of 40 units in Book Bridges.